1) Determine which chores you expect your child to do and make sure that she is capable of doing those chores and actually knows how to do them. Sometimes it is worth it to do the chores together with your child in the beginning until she becomes proficient. Check out our list of age-appropriate chores. Often, we just assume that our child knows how to do something when they really don’t. 2) Use a chore chart template to keep track of chores that need to be done and those that are completed. We have many free printable chore charts on this site which you can download and/or print. Choose a chore chart that you think your child will like or choose one together with him/her. 3) Don’t ask your child to do more chores than she can handle. Some kids have a heavy schedule with homework, afternoon-activities and their social life. They might not be able to do too many chores. Don’t ask them to do more than they can handle. They are only kids after all. When they grow up their priorities will have to change whether they like it or not. They still have a few years to enjoy when “having fun” can be a priority. 4) Don’t forget to recognize the effort your child is putting into chores and compliment her. Let her know how well she is doing. Everyone loves to be praised. How do you feel when you put a lot of effort into an assignment at work and your boss doesn’t even notice that you completed it. 5) Tie chores to an allowance or reward such as screen time. For example, only allow your child screen time once she has completed her chores. You can also enable screen time before chores are complete but add additional screen time to reward her for completing her chores or give bonus chores for extra screen time. Another incentive it to determine that in order to receive an allowance your child needs to complete all chores. If she only completes half her chores she only gets half an allowance. If you need to remind her more than once to do her chores you can also decrease the allowance (optional). There are certain benefits to being part of a family (such as receiving an allowance) however, there are also certain duties (such as chores). If you don’t do the duties then you don’t receive the benefits. 6) Set a good example. If you want your child to do her chores every week then you must do yours on time too. If you keep putting your chores off then so will your child. 7) Suggest doing chores together. It is more fun and often more effective. For example, if your child has to load the dishwasher and you have to clear the table you can suggest that you do both chores together. It teaches children to cooperate and help each other which is often a better way to do chores. If two people load the dishwasher it is often a lot easier than one since you don’t have to bend down each time. Working together is more fun and efficient. 8) Try making chores fun. Turn on the music, chat while you work and try and make it fun and enjoyable. 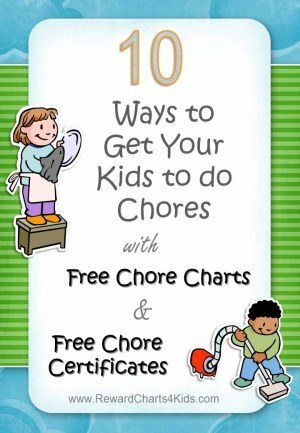 9) Start giving chores to kids when they are young. Young children are often excited to do chores. It makes them feel independent and grown up. If you are consistent then it will become habit and you will never have any issues to deal with. On the other hand, if kids are never expected to participate in household tasks until they are much older they will become used to having everything done for them. It will be a lot more difficult to get them to start doing chores when they are older. 10) Set a deadline or schedule for chores. When we have something to do we will often keep postponing it until the very last minute (I certainly do this). If we don’t have a deadline then that makes postponing the chore even easier. Set a deadline or schedule so that your kids know exactly when they need to get the chores done by.